If you’re a medical marijuana patient or you want to develop the skills and knowledge that can prepare you to work in the cannabis industry, Staff MMJ can help. We can refer you to budtending courses, concentrates courses, continuing education, professional development and hiring support, as well as certification programs. Build the skills and attain the knowledge you need to take on new challenges — while learning in an environment designed to support your personal growth. Choose online courses if you are looking for a learning experience that accomodates your schedule, or choose to live workshops where available. Online courses start immediately, and can be completed in less than 1 day. 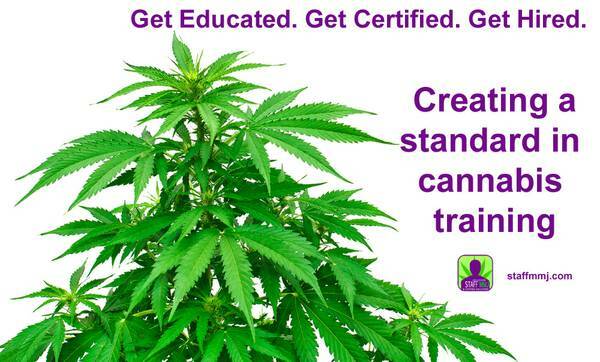 Find out how online cannabis courses can help you by contacting us or request a live chat session at staffmmj.com. *A medical marijuana card is not a requirement for online course registrations or workshop enrollments. **Each state sets forth laws and rules for employment in the marijuana industry. While these courses have been designed with legal/medical marijuana laws in mind, Staff MMJ cannot provide assurance that completion of online courses will allow a student to gain employment. Potential job candidates should check with their local, state, and federal laws to determine the best solutions. ****Although our courses are accepted at many legal marijuana companies throughout the United States and Canada, this may not be the case in all states or institutions. These courses are not eligible for financial aid. ******Certification awards are distributed in GIF and JPEG formats within (2) days of successful completion of an Herbal Risings online cannabis course.